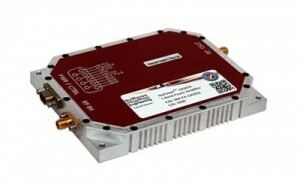 The NuPower™ 13G05A L-Band Power Amplifier is a small, ultra-high-efficiency solid-state power amplifier module for CW operation that delivers, on average, 50 watts of RF power from 800 MHz to 2 GHz, to boost signal power levels of data links and transmitters for communications range extension, electronic warfare (e.g. electronic attack), etc. With a minimum of 45 dB of RF gain, the NuPower 13G05A module is configured for an input drive level of 0 dBm from the transmitter/transceiver. Based on state-of-the-art Gallium Nitride (GaN) device technology, the NuPower 13G05A provides a compelling option for size, weight and power (SWaP) constrained RF telemetry and military communication systems given its 9.6 cubic inch, 9 ounce enclosure and ~50% DC power efficiency. What’s more, the NuPower 13G05A is also operational from 2.0 GHz to 2.5 GHz at lower power levels.